If you raced at Luray Triathlon this year, you probably saw Luray resident Heather Sours at some point during the weekend as she was both our local volunteer coordinator and our primary contact with our partner charity, the United Way of Page County. Oh, and she also raced in the International Triathlon, too. We had a chance to sit down with Heather and find out a little more about her, her involvement with the triathlon and the impact of the race on the local Luray and Page County community. One or two sentences about you. Who are you? What do you do for a living? Where do you live? I live in Luray, VA with my husband, David, and daughter, Lauren. I work for URS Corporation as an Environmental Scientist. For the past 5 years, I have served on the Board of Directors for the United Way of Page County, the benefiting charity of the Luray Triathlon. I started volunteering at the Luray Triathlon in 2009. The event is very inspiring and I’ve volunteered every year since. Volunteering was my first direct experience with the sport of triathlon. 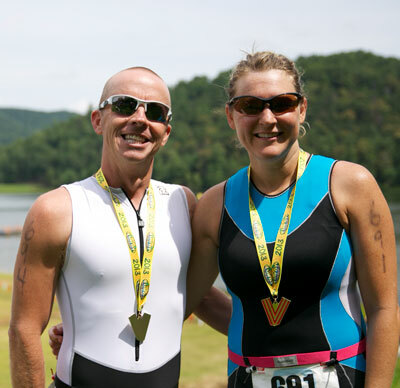 In 2012, my husband, my sister, and I completed the Luray Sprint Triathlon, and we are all hooked on the sport! I love the energy that the event brings to my hometown. So many people in our community support the triathlon and come out year after year to volunteer. The Luray Triathlon is a true community event and it’s so exciting to have several volunteer groups come out to support the event. How have you seen the community impacted in the past 8 years since the triathlon has “come to town”? I think the most positive impact on our community has been the sense of collaboration. No one group alone can provide all of the support needed to make the Luray Triathlon successful. The Luray Triathlon is a true community event and numerous vollunteer groups come out to support the event, including the Luray Rescue Squad, the local fire departments, police, town officials, local churches, the Luray-Page County Chamber of Commerce, Luray Downtown Initiative, United Way of Page County, Luray High School sports, Page County High School sports, Page County Grown, and the list goes on. In addition to this sense of collaboration, the Luray Triathlon provides significant economic support to the United Way of Page County and other local community groups. This monetary contribution helps provide services for those in need within our county. Triathlon has taught me to step out of my comfort zone. I enjoy that feeling of pushing myself harder, and accomplishing something that I initially thought I could not do. I also find so much inspiration at the events, it’s amazing to see people from all walks of life, all shapes and sizes, from teenagers to seniors, crossing the finish line. Do you think that your lifestyle has changed dramatically since you did your first triathlon? If so, in what ways? Yes, my lifestyle has changed dramatically since my first triathlon. I am more active and feel healthier and stronger at 38 than I’ve felt in my life. Purchase a training plan and follow the plan as much as your schedule allows. My husband purchased the Luray Triathlon training plan to prepare for our first triathlon. My work schedule did not allow me to complete every workout, but I was able to complete at least 5 workouts per week and I felt very prepared for the event. The other piece of advice would be to practice open water swimming. If you do not have access to open water, or feel like you need more practice, then I would recommend the Pre-race clinic.